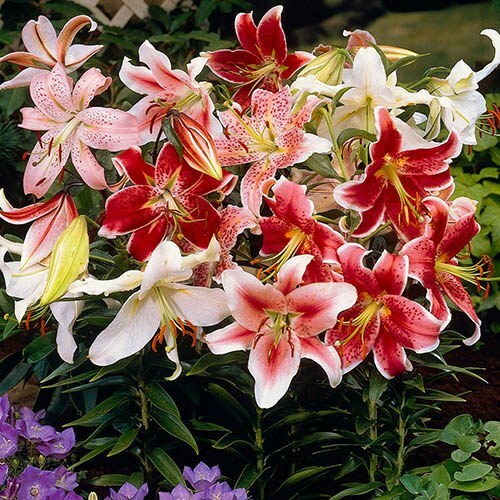 This collection of classic Oriental Lilies and brightly coloured Asiatic Lilies brings together two of the most beautiful varieties on the market. Our Asiatic Lilies have bright, upward facing blooms that flower earlier than most other lilies thereby extending the flowering season and giving you joy for even longer. Our Oriental Lilies are highly fragrant and flower year after year in beds, borders or patio pots and each ‘double nose’ bulb should give 2 flower stems, each carrying 3-5 fragrant florets! Both varieties have incredibly strong stems to support the many blooms you get per bulb and make perfect pot or border plants, plus cut flowers too. Supplied as a set of 50 bulbs, 25 of each variety, ready to plant out - winter hardy. Oriental lilies are highly fragrant and fl ower year after year in beds, borders or patio pots. Each ‘double nose’ bulb should give 2 flower stems, each carrying 3-5 fragrant fl orets! Includes the ever-popular ‘Stargazer’. Height 1.2m (4ft).